Create a rustic, almost western, atmosphere in your home with this rolling nightstand. 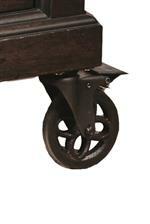 This unique piece sits on a set of classically styled casters reminiscent of old cart wheels. Furthermore, the wrought metal handle hardware provides a stylish industrial touch. The case is constructed from acacia veneers over hardwood solids in a deep espresso finish that completes the piece with a bold look. The Fulton Street 3 Drawer Rolling Nighstand in a Deep Espresso Finish by Samuel Lawrence at AHFA in the area. Product availability may vary. Contact us for the most current availability on this product. Inspired by the energy of early industrialism, this whole home collection will breathe new life into your home. A deep espresso finish is paired with metal bases and accents to create a unique urban look. However, the pieces of this collection will shine in any style home, anywhere. The Fulton Street collection is a great option if you are looking for Rustic Industrial furniture in the area. Browse other items in the Fulton Street collection from AHFA in the area.